THE NATURAL HAVEN: Reader Question: Can honey lighten hair? Reader Question: Can honey lighten hair? A comment was left on the blog asking me to look at Ktani's post (didn't specify which one) on long hair community which discussed in detail on using honey to lighten hair and I was asked if that information was true. Q1: What do I think about Ktani's info? Well if you are curious on natural methods, Ktani's blog is definitely a source you can scour. I think her posts are quite meticulous and she peppers quite a few with good references. Yes honey does contain hydrogen peroxide and yes hydrogen peroxide can bleach hair. Yes honey is being explored heavily (and I mean heavily!) in science right now because it is thought that the hydrogen peroxide can help in healing wounds, especially those which are difficult to bandage or have failed to heal. Here is an excellent web page with more detail. Q2: Does honey lighten hair? Q3:Would this method be better for hair than hydrogen peroxide? Well it is a personal decision. Some hair can handle bleaching better than others, remembering that this process does raise the hair cuticle, can weaken the cortex of hair and cause breakage. Most of the results from Ktani's site show very mild colour differences even with repeated treatments so it may be more gentle than the conventional 3% hydrogen peroxide? I also haven't seen many curly heads on the page and certainly no one who I would call a super curly. Would this method be as successful on hair which is prone to dryness and breakage? Some of you may think, I add honey to my conditioner and my hair colour has never changed?! Well all the more reason to read Ktani's info, she has taken a lot of time to build her database and so I will give her due credit and send you over to look at it!! Shoot! 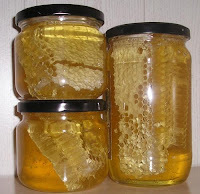 I wish I read this before I went and pre-pooed adding honey. I heard that it was a humencant so it attracts moisture to the hair. But during washing I had never seen so much breakage and shedding ever than today. I guess no honey for my hair again. I was having such a good hair week too. This "method" did nothing for me. At best, it makes the one who tries to believe their hair it is a little bit lighter, when in fact even pictorial evidence is not reliable because digital camera may vary how light/dark the picture is, which defeats the purpose of comparison. In those dosages, the honey will release less than a drop of hydrogen peroxide into the water (at best). How much a drop of peroxide can lighten when left for a mere hour? How much damage can it inflict? The answer to both is probably too little to notice. It doesn't work. I tried for months and no change. I am dark blonde. I have recently tried this twice and it actually worked. I have very curly red hair, and I noticed the straighter hair around my face has gone a strawberry blonde color. However, it doesn't seem to have affected the super curly parts.